How do I use shortcodes to display MLS data in posts? How do I add multiple values to the link structure? 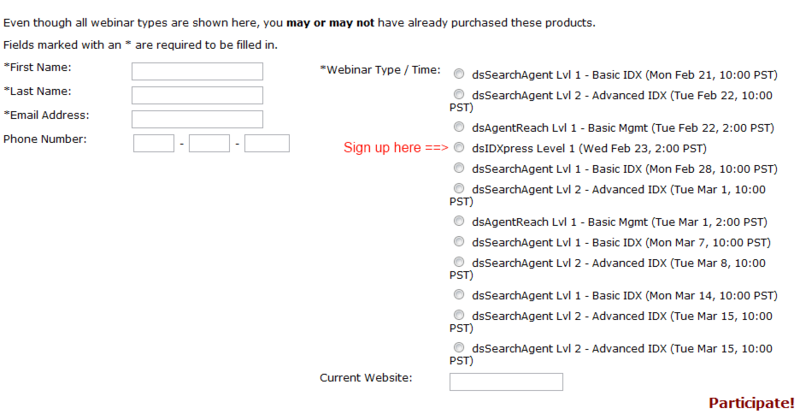 Then, locate and select the appropriate webinar date and time. Fill in your required information and you’ll be emailed log-in instructions. This is our first series of dsIDXpress webinars so we have them scheduled into two separate webinars: dsIDXpress Level 1 & dsIDXpress Level 2. We may or may not break these up to include a 3rd webinar to differentiate between advanced level users and novice users. Just let us know what you’re looking to learn before and/or after the webinar or in the comments below and we’ll make sure to cover it with you. Lastly, we will not be offering a recording of the webinar at this time, however we will be scheduling dsIDXpress webinars weekly, just check back into your Control Panel for more dates. Right on. I’d love to see a series where actual users take us behind the scenes of their site to show us how they use the products. BTW – you need a microphone for those new videos on YouTube. I can barely hear you. @Steph: Ok, you’re the 4th person to mention the volume in the videos. I am hooked up to a microphone. Perhaps it’s one of the settings that isn’t capturing the audio well so I’ll double-check it. In regards to the series idea you mentioned, it’s a great idea! I’ve thought about this and the idea of perhaps capturing a series like this on audio (as interviews). Thoughts? I wish these were available on your YouTube channel. I don’t have time to watch webinars during work hours and prefer to watch the training videos at home. 2. To have some sort of handbook that explains the short codes for DSIDXPress. All I want is to be able to have this program work properly on my website which it has not done since I signed up two months ago.